This past summer I visited my parents in Southern New Jersey for a few days. They are just over half an hour from Philadelphia – home of the Philly Cheese Steak Sandwich. I did have a great sandwich during my visit. Upon my return to California I wanted to make it from scratch, not using the frozen minute steak product that I have used in the past. After a quick search on the internet I discovered that the best meat to use is Rib Eye. There is no going back! Delicious. The first two times I made it I completely forgot to take pictures of my sandwiches, so of course.. I had to make them again (and forgot again) and again. I prefer them on a good crunchy French roll, but a Kaiser roll will do the job. In order to slice the steaks paper thin, it really helps to freeze the steaks for 45 minutes before slicing them and having a nicely sharpened chefs knife will make it an easy process as well. Freeze the steaks for 45 minutes to help the meat become a little stiffer and easier to slice paper thin. I remove the bone first as well as large pieces of fat before slicing. Using a nicely sharpened knife begin cutting each steak thinly at across the grain. You want it to be as thin as possible. Slice your French rolls and toast them under the broiler. In a large non stick skillet saute the thinly sliced onions in about 1 tablespoon of canola oil. Season the onions with salt and pepper and cook over medium high heat until the onions have softened and caramelized. Remove the onions to a bowl and over with foil to keep warm. Saute the peppers next, using the same skillet. When the peppers are softened, remove them to a second bowl. Next, saute the mushrooms in the same skillet until they are golden brown, adding more oil if necessary and seasoning with salt and pepper. Remove to a bowl and cover with foil. Heat the same skillet over High- medium high heat and add 1 teaspoon of canola oil. Add a quarter of the shaved steak to the pan and cook for 1 minute. Stir. Cook an additional minute or two as you desire. Mound the steak in one area of the skillet and top with two slices of provolone cheese. Allow the cheese to melt. With a spatula, carefully lift the cheese topped steak and place on the toasted roll. I like to have each person top their cheese steak sandwiches with sauteed onions, mushrooms, or peppers as desired. Categories: Ethnic - American, Main Dish, Main Dish - Beef, Sandwiches | Permalink. In a zip top bag, combine the garlic, 1 tablespoon sugar, 1 teaspoon salt, 1/4 teaspoon pepper, and 1 tablespoon of the canola oil and add the steak cubes. Refrigerate for about two hours. For the sauce: In a small bowl, combine the remaining tablespoon of sugar, rice-wine vinegar, white white, soy sauce, fish sauce and stir. Cut the lime into wedges (also for seasoning just before eating). Thinly slice the red onion and cut the scallions into pieces. Heat a wok over medium high heat and add 3 tablespoons of canola oil. When the oil is shimmering add half the beef cubes at a time. Sear for 4 minutes, turn the steak cubes over and repeat to brown. Add half the red onion slices and scallions and cook for half a minute longer. Add half the sauce to the beef mixture and cook for a minute longer. Melt half the butter into the sauce and remove the beef onion mixture to a large bowl. Repeat with remaining oil and beef following the same process. Finishing with the sauce and butter. Add to the bowl of cooked beef and onions. Place the watercress and lettuce on a large platter and arrange the beef and onions on the bed of lettuce. Pour the sauce over the beef and onion mixture. Serve. Season with additional salt and pepper mixture if desired and squeeze lime juice over the beef. Categories: Ethnic, Ethnic - Asian, Main Dish, Main Dish - Beef | Tags: Shaking Beef | Permalink. Growing up as a missionary kid, I had plenty of opportunities to try International foods. One such occasion, a family friend, who had served in Morocco as a missionary, made a wonderful stew with chicken and chickpeas served over couscous. Our friend Lena has since passed away, but my parents were able to ask for an authentic recipe for Moroccan Couscous from another missionary family that they know. This family had served in Rabat, Morocco for over 20 years. It had been on my bucket list to make this recipe for a few years now, and this week, I finally had the time to make it. It has a long list of ingredients and several steps to make the stew. It serves 10 – I did not think this through with only 3 of us home at the moment to enjoy it- I have a feeling I will be freezing some of this. You do need to start the night before, by soaking the dry chickpeas. The stew takes about 3- 4 hours prep time to finish. I cooked mine longer, because I wanted to get my Sunday nap! It made the meat ever so tender. This recipe is broken down into 3 stages because there are so many ingredients. Heat 2 tablespoons of oil in a large stock pot over medium high heat. Brown the meat in batches on both sides. Remove the meat to a large platter. Cook the onions in the drippings for about 4 minutes. Add the meat back into the pot. Add soaked and drained garbanzo beans (chickpeas), chopped tomatoes, salt, pepper, paprika, saffron, ginger and turmeric to the pot and stir to combine. Cover the meat in 3-4 quarts of low sodium chicken broth. Bring the broth to a boil, reduce heat to low and cook coverd for 1 hour (or longer). Add carrots, turnips, parsley and cilantro to the stew. Continue cooking the stew at a low boil uncovered for 30 minutes. After 30 minutes add the remaining ingredients listed in stage 2 and cook an additional 30 minutes. At this point I removed the chicken thighs from the stew and removed the skin and bones and added the meat back into the stew. In a small sauce pan, ladle 2 cups of the broth from the stew. Split a jalapeno about 1 inch from the tip and put into the broth. Bring to a boil and reduce heat to low. Simmer for 20 minutes. In a large skillet, heat the butter over medium high heat. Saute the onions in the butter until they are golden brown, stirring occasionally. While the onions are caramelizing, spit the remaining jalapeno and remove the seeds. Mince the jalapeno finely. Add the jalapenos to the onions along with cinnamon, black pepper and saute for a minute or two. Add the raisins and honey to the onions and stir to combine. Discard the jalapeno from the small saute pan and add the broth to the onion mixture. Add this onion mixture to the stew. Stir to combine. Cook couscous according to package directions. To Serve: Mound the cooked couscous on a large platter. Ladle the Moroccan stew over the couscous and allow each person to eat a wedge from the common plate (this is how it is traditionally served and enjoyed) if you prefer however you can place couscous in a small individual bowls and serve the stew over it. Categories: Ethnic, Ethnic - Moroccan, Main Dish, Main Dish - Beef, Main Dish - Chicken, Main Dish - Soups | Tags: Authentic Moroccan Couscous, Moroccan Couscous, Moroccan Stew | Permalink. So I joined the April Health Challenge (www.meltdownchallenge.com), and in an effort to find new low calorie meals I hit one of my cookbooks in my expansive cookbook collection. This recipe is adapted from Cooking Light. Don’t let the “Thai” scare you off – this recipe is pretty mild in my opinion. If you do not like much spice, leave out the red pepper flakes. 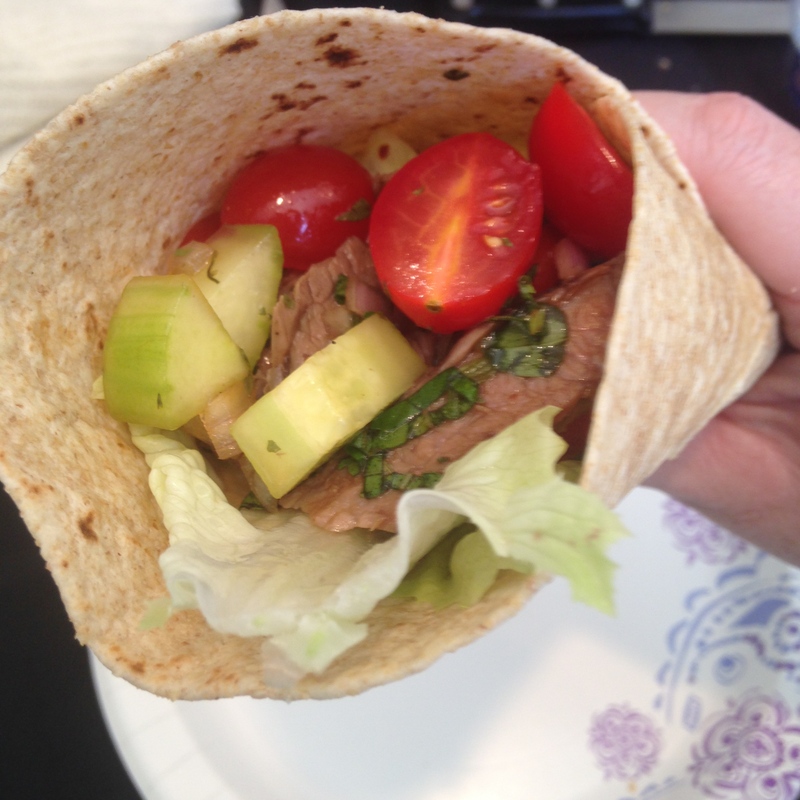 I sweetened the sauce a little, but the wrap was delicious! I cooked twice as much flank steak as the recipe called for, so I have enough to add some protein to some other salads this week. Win win! If you want to eliminate gluten, eat it as a lettuce wrap or a steak salad! Season your flank steak with salt and pepper on both sides. Prepare the grill with cooking spray. Grill the flank steak on high for 4 minutes each side. Remove from grill. Allow to rest 5 minutes, while you prep the remaining ingredients. Prepare the sauce: Combine the 2 Tbsp of brown sugar, soy sauce, lime (or lemon) juice, crushed red pepper flakes, and mix to combine. Taste the sauce and adjust the sugar if you desire a little sweeter sauce (I added about 1 Tbsp of additional brown sugar). Slice the rested flank steak into thin strips, cutting against the grain. Add the steak to the cucumber mixture. Drizzle the sauce over the steak and cucumber mixture. In the microwave, heat up the flour tortillas between pieces of damp paper towels for about 20 seconds. Notes: if you wish to eliminate gluten you could easily serve this on lettuce as a salad. 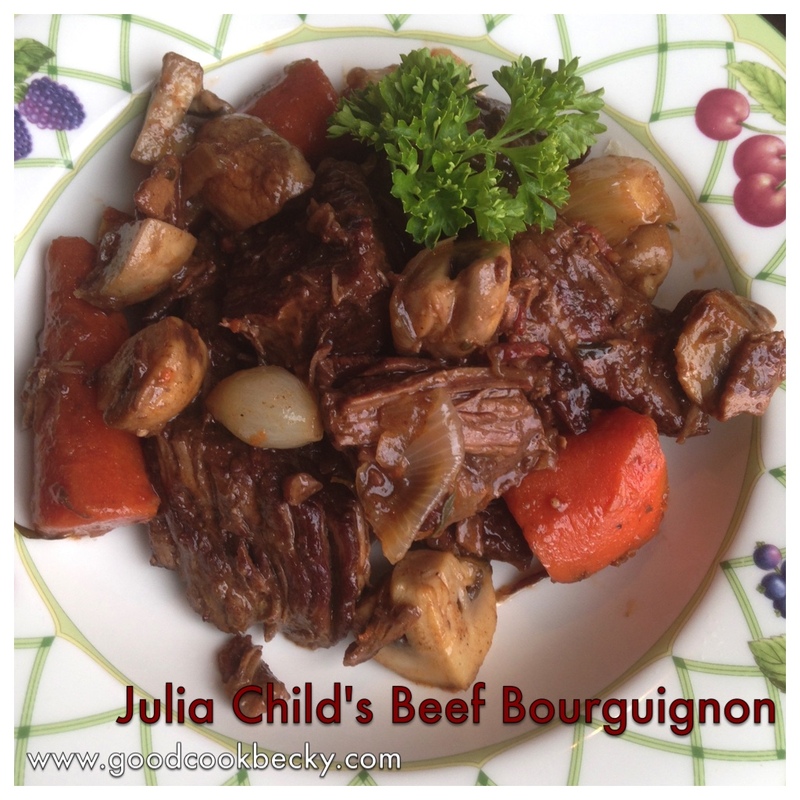 Categories: Main Dish, Main Dish - Beef, Main Dish - Healthy, Meltdown Challenge Recipes, Sandwiches | Permalink. Every year a group of our friends gets together for their Annual Chili Cook-Off. I love going to them, not just to try to win, but to enjoy the fellowship of our long time friends. We do not see them very often, as we live in another county, but when we do it is a treat to pick up where we left off! This year I tried a few new recipes and found a new secret weapon: the pressure cooker! I know a lot of you are now backing away from your computer right now because you see it exploding! The modern pressure cookers have valves that prevent that from happening. My parents gave me a nice German made Fissler pressure cooker about 12 years ago, it has been a great tool in the kitchen. I just never made chili in it before! What the pressure cooker does to the meat (cheap chuck roast, trimmed of its fat) is amazing. The downfall of cooking it in the crock pot for hours is that the meat tends to get stringy – but it is very tender. In the pressure cooker, the meat becomes tender and juicy but still holds its consistency. I have a chili recipe that I really have liked for a long time. This year I decided to tweak it just a little and to cook it in the pressure cooker. I did the prep work in my trusty cast iron skillet, because I like how well it retains the heat and it holds a lot. Then I finished it in the pressure cooker. I could have just used my pressure cooker rather than dirty another pot, but I find it a little more cumbersome to cook bacon and brown the meat in it. I heated my cast iron skillet up about 10 minutes over medium high heat, before I cooked the bacon, rendering out the fat. I drained the crisp bacon on paper towels and poured off the bacon fat to a small bowl, leaving about 1 tablespoon of fat in my skillet. I had removed most of the fat from my beef chuck roast and cut into bite sized pieces. Seasoned the meat with salt, pepper, and garlic powder before browning the meat cubes in the skillet over medium high heat in the bacon fat. I did this in smaller batches so that the meat had a chance to brown. I stirred a few times and removed the meat to a bowl. Repeated the process with the remaining meat until the meat cubes were also browned. I added a tablespoon of bacon fat to each batch to aid the browning. I once again removed all the meat from the skillet. I ladled the chili into my pressure cooker, secured the lid, cranked the heat to high and watched carefully to make sure it had reached high pressure before turning my burner down and setting the timer for 15 minutes. I do keep a careful watch to maintain the pressure on high (mine has an indicator for high and low pressure – the low is intended for veggies and such). After the timer went off, I turned off the heat and allowed the pot to sit until the pressure released itself on its own and the valves released steam. This took another 15 minutes or so. After the lid released, I stirred in the beans. Forced my husband to taste it with me (it did not take much persuasion) and allowed it to cool before putting it in the fridge.. that’s right.. the chili is really better the second day.. Serve with crisp bacon bits, sour cream if desired, and grated cheddar cheese. My children insist that when I make chili I also make Corn Bread Pudding . 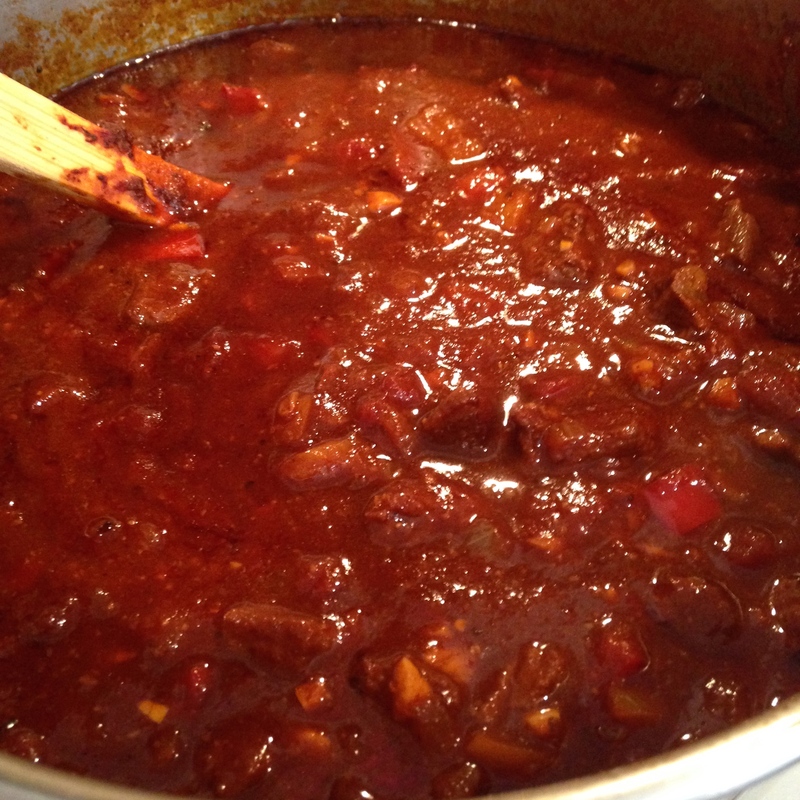 Categories: Main Dish, Main Dish - Beef | Tags: Chili with beans, Pressure Cooker, Pressure Cooker Chili | Permalink.